Tucked away just outside the heart of Clintonville, Ohio 451 Spirits has been quietly and patiently setting up a new distillery. This marks the 3rd licensed distillery in Columbus, Ohio following in the footsteps of Middle West Spirits and Watershed Distillery. I first learned of the new distillery from one of the 3 partners, Chad Kessler. Chad is the Spirits Manager from one of my favorite liquor stores located inside Weiland’s Gourmet Market. Chad and I are kindred spirits (no pun intended) and often discuss our interest in less mainstream whiskies (like quinoa whiskey), and odd flavor profiles. When Chad broke the news last fall that he and his other distillery partner Dave Chew were finally running a few things through their pot still, I jumped at the chance to go visit and get to the bottom of the new 451 Spirits distillery. I met up with Chad and Dave last fall on a Sunday afternoon and when I arrived Dave was already hard at work (full confession, life got busy and this article has been sitting for many months). The first thing I noticed is that these guys just love being at the distillery and geek out about the process of making spirits just as much as I do (or more). We pulled up some chairs and began swapping stories about how our love for whisk(e)y started in the first place. Chad shared a story about how while on a camping trip his friends tried to tell him whiskey was for taking shots, but when he took his first sip he decided his friends were crazy and that whisk(e)y was best enjoyed when savored slowly. Next Dave explained his start with Scotch whisky and his recent adventures using the “Drunken Botanist” as a guide to get more exposure to all things non-whisk(e)y including tequila, rum, and absinthe. Prior to Chad and Dave meeting and starting 451 Spirits, Chad shared that he was always impressed with his friend’s homemade stills and often daydreamed about one day opening his own distillery. Fortunately, Chad didn’t have to wait long before being introduced to Dave (through their current silent partner) who was seeking a way to utilize his business background and interest in spirits to find the right business partner to open a Columbus, Ohio based distillery. The two agreed that getting into the market wasn’t about trying to replace the popular spirits already available in most home liquor cabinets, but to create truly innovative, small batch spirits as an alternative option. Their focus would be on trying to create something completely original using mash bills from scratch and breaking the mold on what can be done. The two shared that fortunately 451 Spirits had the funding it needed to allow them to focus on their initial product runs instead of needing to sell white dog, tee-shirts, or other marketing swag in order to keep the lights on. Creating new spirit recipes, or a twist on spirit recipes from long ago is actually how the name “451 Spirits” came about. According to Dave, the name “451 Spirits” is an homage to all the distilling knowledge lost during prohibition when many distilleries were forced to close causing recipes, knowledge, and trade secrets to disappear forever. They consider the name a nod to the popular sci-fi novel by Ray Bradbury “Fahrenheit 451” in which the government restricts access to information, and any books found in public possession are to be confiscated and destroyed by fire. Knowing their goals and adventurous outlook on production, I’m positive that there will be many innovative products coming out under the 451 Spirits label, but for now the distillery’s focus is on smoked whiskey, absinthe, and aged rum. 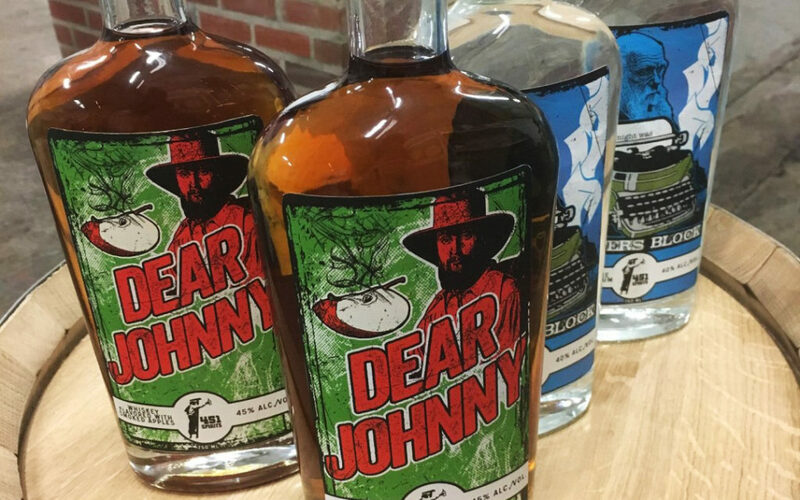 Their initial products released in February 2016 included a smoked apple flavored whiskey aptly named “Dear Johnny” as well as a mint and lime infused rum named “Writer’s Block” (and I just heard that the absinthe is only weeks away). The pair are still working with the state to find out what stores will be carrying 451 Spirits products, but for now they are available to purchase at most Columbus based liquor stores, as well as a few select bars for those wishing to try it by the glass. Lastly, if you’re worried about finding these bottles, don’t be, much like the spirits themselves, the artwork for the bottle labels are bright, bold, and full of personality making them easy to spot on even the most spirits shelves. Opening the distillery did present some challenges, but fortunately the largest hurdle they have faced is simply time. 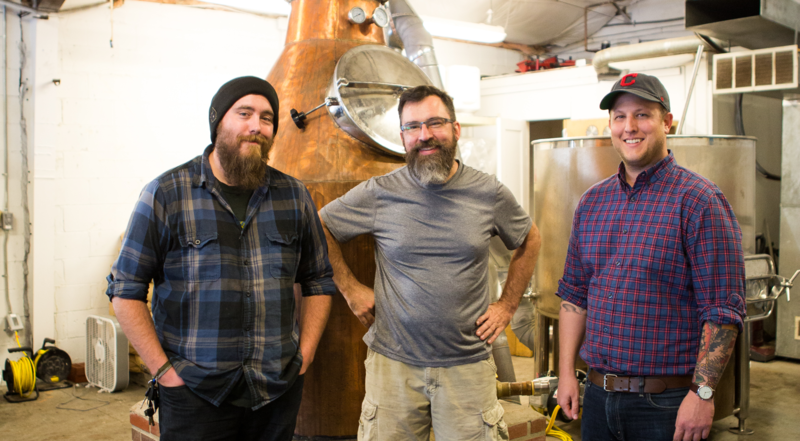 Chad and Dave shared that it’s been very difficult to find enough time to work in the distillery, so to help help keep themselves focused and cranking away they are not currently offering tours or tastings at the distillery. In parting, if you’re in the market to try something new, local, and different than the norm, ask your local liquor store to request a few bottles from the state or keep your eyes peeled for local tasting events on their Facebook page or give them a call at 614-929-3836. I wish these guys all the best and can’t wait to see what they come up with in the years to come.